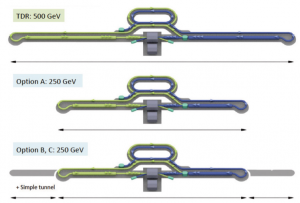 In November 2017, the International Committee for Future Accelerators (ICFA) issued a statement supporting the construction of the International Linear Collider (ILC) operating at 250 GeV. It is based on machine and physics reports from the linear collider community. Following Jim Brau’s view on the physics case in the last issue, here is my personal of the ILC 250 GeV accelerator. A 250-GeV machine would imply the installation of approximately half of the linac of the 500 GeV machine. There are several possible scenarios for the civil construction and conventional facilities; three of them are considered in this report. Option A: Only the tunnel for the 250 GeV machine is constructed and equipped. If at a later stage the machine energy would be increased, the tunnel length would have to be extended, requiring extensive additional civil engineering later. 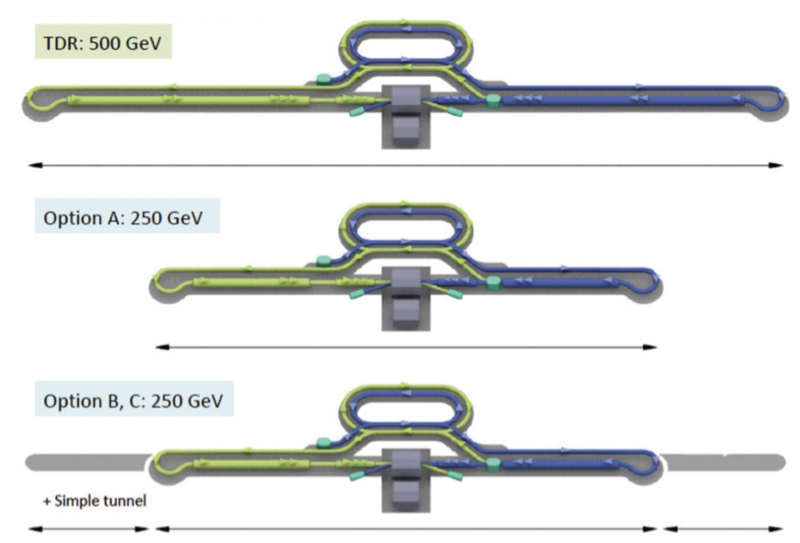 Option B: The tunnel length allows the energy to be increased to 350 GeV (the top quark threshold) later by adding more acceleration structures. Only the downstream part is filled with a linac. The remaining length of the tunnel will be left in a bare state (no dividing wall, cooling, or ventilation) to save money. Upgrading the energy to 350 GeV would then require finishing the tunnel and installing extra cavities. Option C: The complete tunnel and access shafts for the 500-GeV machine is constructed at the beginning, and only the downstream part is filled with a linac. The remaining length of the tunnel will be left in a bare state (no dividing wall, cooling, or ventilation), the same as Option B. Upgrading the energy to 500 GeV then requires finishing the tunnel and installing extra cavities. The first scenario (Option A) represents the lowest cost. The second and third ones obviously require extra investment, but allow a simple possibility of increasing the centre-of-mass energy without major tunneling work. All options include possible cost reductions when the following R&D efforts succeed (as Options A’, B’, and C’). The costs of options A to C and A’ to C’ are calculated in comparison with the cost of Technical Design Report (TDR) as in this research study – see table below. The TDR baseline design produces positrons by transporting the primary electron beam through a superconducting helical undulator. In the case of a 125-GeV electron beam, the required positron flux can be generated by increasing the undulator length from 147 metres to 231 metres. This longer undulator positron source is the new baseline for the ILC250. An electron-driven design is an alternative to the TDR undulator concept for positron production. Although polarised positrons are not available in this scheme, positron beam commissioning is possible without a 125 GeV electron source. We found that there is no cost difference between accelerator components for the undulator and electron-driven source of positrons. Some cost reduction associated with the electron-driven system is expected if the space for the timing constraint in the undulator scheme is omitted. The undulator source will still be considered as the baseline source of positrons. However, an electron-driven source of positrons could be adopted initially for ILC 250 GeV and be replaced by the undulator source in future upgrades, depending on the technical maturity, because an electron-driven source is safer for achieving design luminosity at low electron energies (~125 GeV) and has the big advantage that positron beam commissioning can be performed without employing a full electron linac and a damping ring. However, it has the disadvantage of no positron polarisation. The cost estimate is carried out in so-called ILC Units, or “ILCU”. The TDR defined the “ILCU” as the United States dollar as in January 2012. The radiofrequency (RF) unit cost and other unit cost is calculated from the TDR. The ILC250 cost is obtained by subtracting the decreased number of units. The reduced volume production effect and the price fluctuation from 2012 are ignored because these depend on different components. The accelerator parameters described in the TDR are based on the best optimisation for a centre-of-mass energy of 500 GeV. The machine parameters at lower energies described in the TDR are obtained by scaling from 500 GeV. Some improvement in the machine design parameters is carried out through the re-optimisation for a centre-of-mass energy of 250 GeV. The resulting luminosity is 1.35 × 1034 /cm2/s at 250 GeV, and thus by a factor of 1.65 higher than that for the TDR. https://journals.aps.org/prl/abstract/10.1103/PhysRevLett.116.214801 Production of Highly Polarized Positrons Using Polarized Electrons at MeV Energies . Current is low so luminosity would drop three orders of magnitude, but some physics that might otherwise be inaccessible might be possible.